Family, honor, faith and role models are the most powerful tools Americans have to reclaim their great country from the throes of economic chaos, according to the two speakers at a special “Bringing America to Honor” event held near Pittsburgh on June 1st. John Horvat II, vice president of the American Society for the Defense of Tradition, Family and Property (TFP) and author of Return to Order: From a Frenzied Economy to an Organic Christian Society, and Norman Fulkerson, TFP member and award-winning author of An American Knight: The Life of Colonel John W. Ripley, USMC, shared their solutions for a better America and autographed copies of their award-winning books at the Bridgeville Fire Hall Chartiers Room in Bridgeville, Pennsylvania. 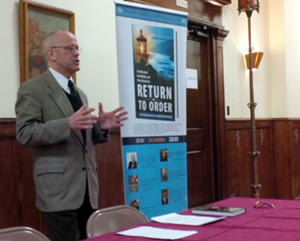 Mr. Horvat presented “Honor Thy Father and Thy Mother: The Key to Bringing America Back to Order,” which focused on what it means to honor parents, why the family needs to be fired up with the idea of honor and how a sense of honor can revitalize all society. Mr. Fulkerson, who is a contributing editor of Crusade Magazine, presented “How Role Models Can Inspire the Family: The Case of Colonel John Ripley, USMC,” which demonstrated how role models can change family dynamics, invigorate parents and inspire the hearts of teenagers. An American Knight, a Military Writers of America 2010 Gold Medal Winner (Biography), draws on Colonel Ripley’s achievements to inspire members of a hero-starved society to step up to the plate and become leaders. The successful double signing was well attended and well organized by local coordinators, Mr. and Mrs. Thomas Zimmerman. 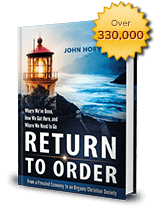 This entry was posted in Featured and tagged America, Family, financial speculation, frenetic intemperance, Return to Order by John Horvat II. Bookmark the permalink.